Chick-fil-A celebrates the athletes shaping their communities. Created in 2005, the Wuerffel Trophy has quickly become a notable college football award, recognizing players for their commitment to community service. But how did this award get its start? From a young age, Danny Wuerffel’s parents instilled in him the value of giving back to others. He brought that compassion with him to the University of Florida. In between quarterbacking the Gators to their first national championship in 1996—he would also win the Heisman Trophy that year—he led the school’s Fellowship of Christian Athletes chapter, mentored and tutored students and volunteered at local hospitals. When Wuerffel was drafted by the New Orleans Saints in 1997, he sought a new way to give back to his new community. “When I got to New Orleans, I was really asking the question, ‘Beyond football, why am I here? What am I supposed to be a part of?’” Wuerffel said. He got involved with Desire Street Ministries, which sought to revitalize New Orleans’ Desire neighborhood. He helped out however he could, from teaching classes and participating in recreational programs to fundraising. Even after moving on from the Saints, he always returned in the off-season to volunteer. Following Hurricane Katrina, Wuerffel stepped up to become Desire Street Ministries’ executive director. He was charged with leading the organization through a natural disaster that had ruined its facilities and displaced the kids it served. Wuerffel relocated the organization to Atlanta and expanded its mission to help under-resourced neighborhoods throughout the Southeast while helping rebuild New Orleans. While Wuerffel settled in to his new role, the All Sports Association surveyed the college football landscape and saw an opportunity to shine a positive light on student athletes. They wanted to present an award, but it would be a different kind of award—focusing not solely on players’ on-the-field performance, but their contributions to the community. And they wanted Danny Wuerffel’s name on it. He was hesitant at first, since college football already had so many awards, but the organization persisted, with a special nudge from Rudy Riska, director of the Heisman Trophy at the time, who had been there for 50 years. The values exhibited by Wuerffel Trophy winners are the same values celebrated by the Chick-fil-A Foundation, which makes the partnership a natural fit. The Foundation’s focus is to help young people reach their potential through education, entrepreneurship and leadership development. Likewise, the Wuerffel Trophy recognizes athletes for the great work they have done to help improve their communities. “My name is on the award, but I don’t know if I’d even be able to win the award today, because these [recipients] have done so much,” Wuerffel said. 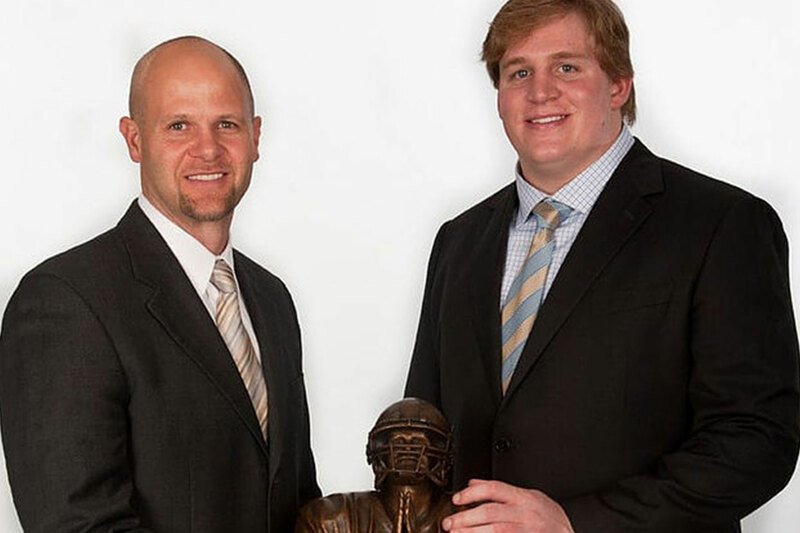 What does it take to win the Wuerffel Trophy? Below are just a few of its past winners. Danny Wuerffel was not the only person looking to help out following Hurricane Katrina. Rudy Niswanger and his LSU teammates volunteered at emergency shelters, distributing supplies and comforting shell-shocked evacuees. Back on campus, Niswanger volunteered with summer reading programs, mentored boys at a local group home and participated in LSU’s Student-Athlete Advisory Committee. Niswanger later played five seasons with the Kansas City Chiefs, chairing the Chiefs’ offensive line charity, First Downs for Downs Syndrome, and serving on the board of the Kansas City Center for the Visually Impaired. Today, he lives in Louisiana with his family and runs his family business, Joe Gear Companies. Barrett Jones did not have much free time, between his studies and playing on the Crimson Tide’s stout offensive line, but he decided early in his college career to dedicate his spring breaks to community service. He took two friends on a service trip to Haiti his sophomore year, returned the next year leading a group of 35 students, and another group to Nicaragua in his final year of college. Jones went on to spend three years in the NFL, and he went on service trips whenever possible. He has returned to Haiti one more time in addition to working in India, Uganda and South Africa. Jones is recently married and now works as a financial advisor in Memphis while spending his weekends in the booth calling games for ESPN. Courtney Love racked up quite a list of service projects during his college career. He volunteered with campus and community organizations at both the University of Nebraska and the University of Kentucky and went on a service trip to Ethiopia. He eventually found his calling with the organization Amachi of Central Kentucky, which mentors children whose parents have been incarcerated. Love’s own father spent time in prison, so providing a positive role model for kids facing the same challenges became Love’s mission. In between mentoring through Amachi, he serves as graduate assistant on Kentucky’s football team and one day wants to start his own nonprofit organization.